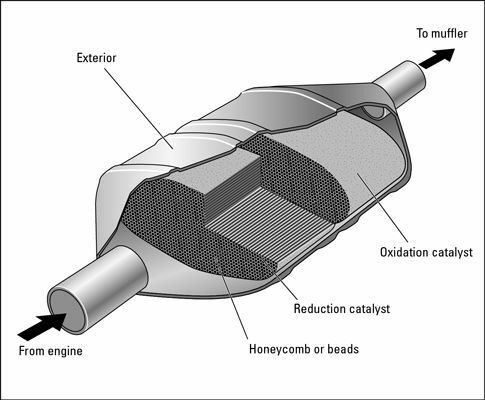 Catalytic converters are one of the most important parts of your car's emissions systems. Created in 1975, these pieces of machinery were developed to convert harmful emissions into less harmful emissions, before they enter our car’s mufflers and exhaust systems. Jack’s Auto Service is an auto repair shop located in Grand Rapids. You can count on our auto service to be thorough, reliable, and offered at an affordable price. We always strive to go the extra mile for our clients, along with continually trying to do what is right by. In fact, Jack’s Auto Service has won a Chamber of Commerce Gold for Customer Service. One time, a couple, from out of town, arrived at our shop with a broke down van pulling a camper. We recognized that our customers were in a dire situation, in need of a good Samaritan. We let them plug into the building and spend the night at our auto repair shop. We performed the necessary repairs, and the next day, the couple was able to drive away, satisfied and safe. This story is one of many examples of how we strive to do what is right for our clients. If you believe your catalytic converter is in need of repair, do not hesitate to schedule an appointment at our facility. Our team of experts will find and solve the problem as safely and efficiently as possible. We will thoroughly inspect your car’s mufflers and exhaust system, and have you back on the road in no time. If your personal automobile or fleet is in need of catalytic converter maintenance or repair, we invite you to Jack’s Auto Service. Located in Grand Rapids, you can trust our friendly and experienced staff to get your car, truck, minivan or SUV driving its best!